If you create a list by selecting one of the built-in types ( Christmas, Thanksgiving, Easter or General), you can still rename it later. This can be useful to create new types e.g. Birthday, party invitation list etc. It can also be very useful to create groups of say Christmas lists – for work colleagues, neighbours etc. Just tap on the little (i) icon to the right of the list name (NOT the list name itself). You will then see the screen below. 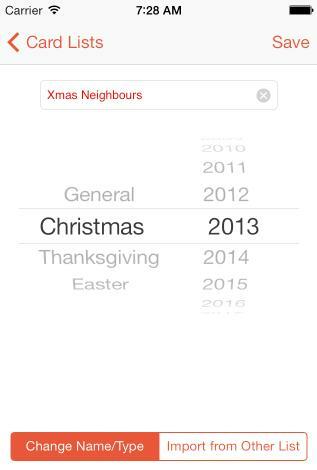 Just type the desired name in the textbox at the top (“Xmas Neighbours” in this case), and hit Save. You could also change the list type or year from here, but that would be “unusual” – probably just if you made a mistake in the first place.